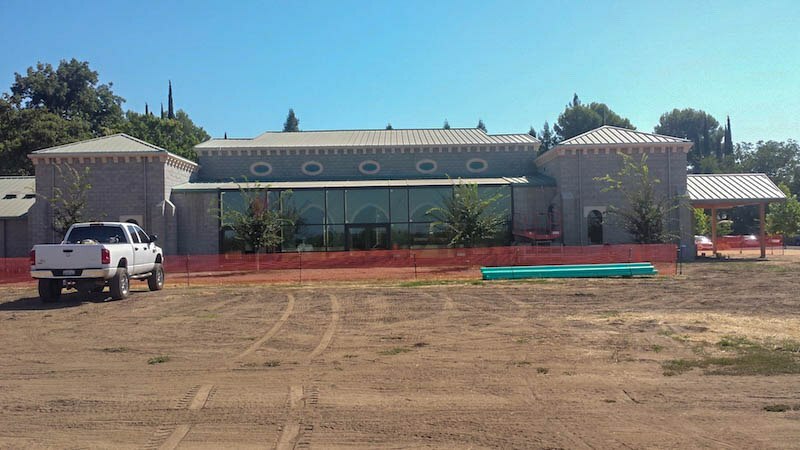 Commercial wood framing project in Vina, Calif. Project is an extension of a very old stone abbey reassembled from its original location in Spain. The monks at New Clairvaux discovered their original chapel had been salvaged after WWII and shipped to San Francisco with the intention of having it rebuilt there. It sat in storage forgotten until discovered by the same order of monks now situated in Vina, just North of Chico. The City was happy to have them take the salvaged limestones and the monks wasted no time finding a contractor to help with the reconstruction. In addition to the stone reassembly, GBI was subcontracted to build the exposed wood frame structures that complement the chapel. Recently the chapel has been opened for services to the public. Mass is now being offered and hours are found on-line at www.newclairvaux.org. There is also a wonderful winery to visit, sample, and enjoy all there is to offer.